When I was in Shanghai, I got to learn a little tidbit about Chinese dining. When we stumbled into a restaurant called Shanghai Spring in Xintiandi, they have two sets of chopsticks on the table. 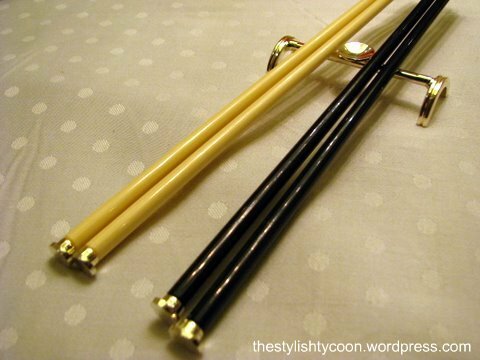 It turned out that the left set of chopsticks (white set, as shown in the picture) is the serving set, which should be used when getting food from the table. The right set (black) should be used for your own use. Interesting. Another thing I learned today about Chinese dining is something I heard over the radio. Have you ever dined at those hole-in-the-wall places in Hong Kong wherein they serve rice dishes, and you'd often see duck/chicken hanging outside their front window? Usually, before they serve you the food they give you tea once you sit down. I have always thought that this was tea for drinking. It turns out that this "tea" is actually used to clean your utensils! Better keep this in mind the next time you're in Hong Kong.